Pitztal, Austria – A training crash on Saturday injured German World Cup ski racer Viktoria Rebensburg, and will keep the athlete from starting the World Cup season in Soelden, Austria later this month, the athlete and the German Ski Federation (DSV) have both confirmed. 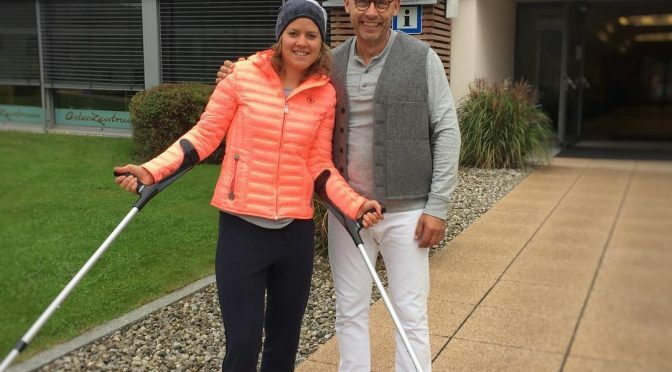 Training on the Pitztal Glacier, Rebensburg caught a giant slalom gate and crashed, resulting in a non-displaced fracture to her right tibia — the weight-bearing bone in the lower leg. “Surgery is not necessary, and we will treat it conservatively with immobilization,” German team doctor Manuel Koehne confirmed, adding that Rebensburg will be off snow for six weeks to recover from the injury. Although she will miss the season opener in Soelden, “the World Cup only really starts in eight weeks’ time with the overseas races (in North America). I’ll be back again for those,” Rebensburg assured.